The Club has traditionally always had a strong women’s section and a commitment to encourage women’s running. As a demonstration of this, the club joined together with the City of Salford to host a 5.25 mile run. Based on an idea from one of our club members, Marie Carvath, we first held the event in 1991 and encouraged by the very warm reception to the event from those taking part we have continued with the event ever since. 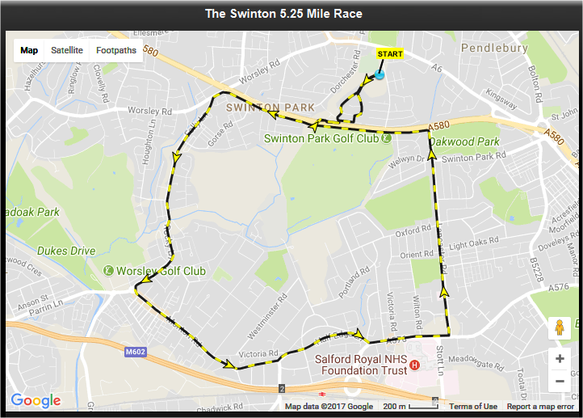 The route as been accurately measured by BAF (British Athletics Federation) at 5.25miles and is recognised by the British Association of Road Races (BARR). HQ will be located at Swinton Football Club on Barton Rd, behind the Farmers Arms Pub off Manchester Rd, Swinton and opposite the former Salford Register Office.